Elephant is the largest land animal and it is found in the plain lands of Asia and Africa. I made this sketch by referencing a photograph from WetCanvas (online forum of artists) and for your information it is free from copyright law. This sketch was done with quick strokes, but I was too restless to complete this in a single sitting. Sketch of a Young Buffalo! I sketched this figure of a young buffalo of my own house. It was probably one year old when I sketched it. Isn't it looking pretty? However, I made a surreal background later to give it a context. It is in open place and not in a barn because it was brought into the open sun for warmth in the winter season and it's already over a year now, after I drew this. It was quite motivating when I drew this by looking at the real animal. Now I can see some flaws on it! But I won't tell you where they are. It's a secret! I had an easy time drawing this cow and its calf. Look! how pretty and innocent they look. The calf is not perfect in the neck. I should have considered a little more bending. I was just in a hurry to finish while sketching this. I noticed the fault much later. I had felt like a rush while sketching this because I was very aggressive then and I wanted to learn to sketch fast. Sketching really tests your patience more than anything else and it took a lot of time to improve and I'm still learning! Sometimes, some pictures turn out to be more beautiful than others because that specific kind of picture was either practiced more or it was really easy to draw. 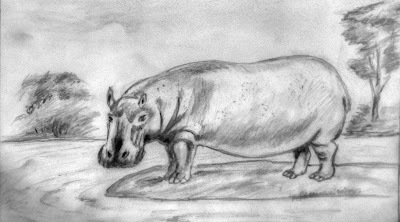 This hippo was also an easy drawing (I mostly draw easy pictures!) but it's beautiful (although far from perfect). 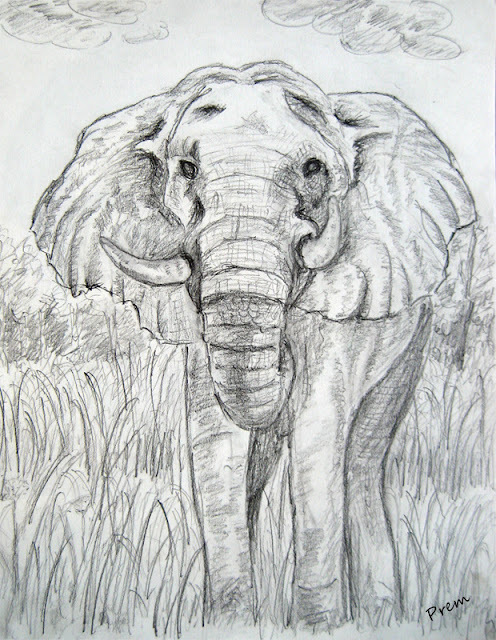 I sketched this one during one of my leisure periods while doing my A Levels. 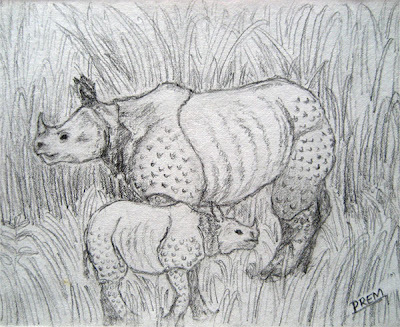 The following sketch is the sketch of Rhinos, which shares similar habitat with the elephants. The sketch is a practice work done casually on a cheap chart paper and is thus, different from the above paper. Rhinos are also huge animal like elephants. Their numbers are decreasing because of the poaching and illegal hunting to obtain their horn, which has a huge value in the black market. Despite this situation, we should pride on the fact that rare species of rhinos, the one-horned rhinoceros are found only in Nepal, my motherland, and India.